Line cookie sheet with waxed paper. In small bowl, stir 1/4 teaspoon red food color into 1/4 cup of the frosting; blend well. In separate bowl, stir 1 small amount red food color into remaining 1 cup frosting; blend well. For each cookie, frost 1 inch of one corner of cracker with dark red frosting for Santa's hat. Place 1 marshmallow piece in corner for pom-pom. Frost remainder of cracker with pink frosting. 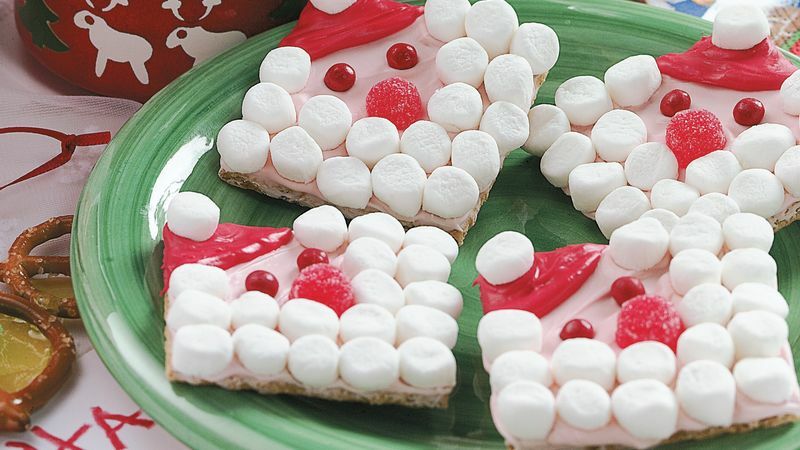 Place marshmallow pieces on pink frosting around 2 sides for beard. Add gumdrop for nose and cinnamon candies for eyes. Place on waxed paper-lined cookie sheet.